For the American financier, see John W. Campbell (financier). For other people, see John Campbell (disambiguation). John Wood Campbell Jr. (June 8, 1910 – July 11, 1971) was an American science fiction writer and editor. He was editor of Astounding Science Fiction (later called Analog Science Fiction and Fact) from late 1937 until his death and was part of the Golden Age of Science Fiction. Campbell wrote super-science space opera under his own name and stories under his primary pseudonym, Don A. Stuart. Campbell also used the pen names Karl Van Kampen and Arthur McCann. His novella Who Goes There? was adapted as the films The Thing from Another World (1951), The Thing (1982), and The Thing (2011). Campbell began writing science fiction at age 18 while attending MIT. He published six short stories, one novel, and six letters in the science fiction magazine Amazing Stories from 1930 to 1931. This work established Campbell's reputation as a writer of space adventure. When in 1934 he began to write stories with a different tone, he wrote as Don A. Stuart. From 1930 until the later part of that decade, Campbell was prolific and successful under both names, though he stopped writing fiction shortly after he became editor of Astounding in 1937. It is as editor of Astounding Science Fiction (later called Analog Science Fiction and Fact) from late 1937 until his death for which Campbell is primarily remembered today. As well, in 1939, Campbell started the fantasy magazine Unknown, although it was canceled after only four years. Referring to his time spent as an editor, The Encyclopedia of Science Fiction wrote: "More than any other individual, he helped to shape modern sf." Isaac Asimov called Campbell "the most powerful force in science fiction ever" and said the "first ten years of his editorship he dominated the field completely." In his capacity as an editor, Campbell published some of the very earliest work, and helped shape the careers, of virtually every important sf author to debut between 1938 and 1946, including Robert A. Heinlein, Theodore Sturgeon, Isaac Asimov, and Arthur C. Clarke. An increasingly strong interest in pseudoscience later alienated Campbell from many of the writers whose careers he had nurtured; Heinlein, Sturgeon, Asimov, and Clarke rarely worked with him after about 1950. As well, beginning in the 1960s, Campbell's controversial essays supporting segregation, and other remarks and writings surrounding slavery and race, served to distance him from many in the science fiction community. Nevertheless, Campbell remained an important figure in science fiction publishing up until his death. Campbell and Astounding shared one of the inaugural Hugo Awards with H. L. Gold and Galaxy at the 1953 World Science Fiction Convention. Subsequently, Campbell and Astounding (later renamed Analog) won the Hugo Award for Best Professional Magazine seven times. Shortly after his death in 1971, the University of Kansas science fiction program established the annual John W. Campbell Memorial Award for Best Science Fiction Novel and also renamed after him its annual Campbell Conference. The World Science Fiction Society established the annual John W. Campbell Award for Best New Writer. The Science Fiction and Fantasy Hall of Fame inducted Campbell in 1996, in its inaugural class of two deceased and two living persons. John Campbell was born in Newark, New Jersey in 1910. His father was an electrical engineer. His mother, Dorothy (née Strahern) had an identical twin who visited them often and who disliked John. John was unable to tell them apart and says he was frequently rebuffed by the person he took to be his mother. Campbell attended the Blair Academy, a boarding school in rural Warren County, New Jersey, but did not graduate because of lack of credits for French and trigonometry. He also attended, without graduating, the Massachusetts Institute of Technology (MIT), where he was befriended by the mathematician Norbert Wiener (who coined the term cybernetics) – but he failed German and MIT dismissed him. After one year at Duke University, he graduated with a Bachelor of Science in physics in 1932. Campbell began writing science fiction at age 18 while attending MIT and sold his first stories quickly. From January 1930 to June 1931, Amazing Stories published six of his short stories, one novel, and six letters. 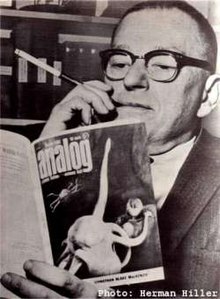 Campbell was editor of Astounding Science Fiction (later called Analog Science Fiction and Fact) from late 1937 until his death. He stopped writing fiction after he became editor of Astounding. Between December 11, 1957, and June 13, 1958, he hosted a weekly science fiction radio program called Exploring Tomorrow. The scripts were written by authors such as Gordon R. Dickson and Robert Silverberg. Campbell and Dona Stewart married in 1931. They divorced in 1949 and he married Margaret (Peg) Winter in 1950. He spent most of his life in New Jersey and died of heart failure at his home in Mountainside, New Jersey. He was an atheist. Editor T. O'Conor Sloane lost Campbell's first manuscript that he accepted for Amazing Stories, entitled "Invaders of the Infinite". "When the Atoms Failed" appeared in January 1930, followed by five more during 1930. Three were part of a space opera series featuring the characters Arcot, Morey, and Wade. A complete novel in the series, Islands of Space, was the cover story in the Spring 1931 Quarterly. During 1934–35 a serial novel, The Mightiest Machine, ran in Astounding Stories, edited by F. Orlin Tremaine, and several stories featuring lead characters Penton and Blake appeared from late 1936 in Thrilling Wonder Stories, edited by Mort Weisinger. The early work for Amazing established Campbell's reputation as a writer of space adventure. When in 1934 he began to publish stories with a different tone he wrote as Don A. Stuart, a pseudonym derived from his wife's maiden name. From 1930 until the later part of that decade, Campbell was prolific and successful under both names. Three significant stories published under the pseudonym are "Twilight" (Astounding, November 1934), "Night" (Astounding, October 1935), and "Who Goes There?" (Astounding, August 1938). "Who Goes There? ", about a group of Antarctic researchers who discover a crashed alien vessel, formerly inhabited by a malevolent shape-changing occupant, was published in Astounding almost a year after Campbell became its editor and it was his last significant piece of fiction, at age 28. It was filmed as The Thing from Another World (1951), The Thing (1982), and again as The Thing (2011). Campbell held the amateur radio call sign W2ZGU, and wrote many articles on electronics and radio for a wide range of magazines. 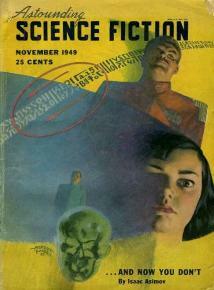 Tremaine hired Campbell to succeed him as the editor of Astounding from its October 1937 issue. Campbell was not given full authority for Astounding until May 1938, but had been responsible for buying stories somewhat earlier. [Note 1] He began to make changes almost immediately, instigating a "mutant" label for unusual stories, and in March 1938 changing the title from Astounding Stories to Astounding Science-Fiction. Lester del Rey's first story, in March 1938, was an early find for Campbell, and in 1939, he published such an extraordinary group of new writers for the first time that the period is generally regarded as the beginning of the "Golden Age of Science Fiction", and the July 1939 issue in particular. [Note 2] The July issue contained A. E. van Vogt's first story, "Black Destroyer", and Asimov's early story "Trends"; August brought Robert A. Heinlein's first story, "Life-Line", and the next month Theodore Sturgeon's first story appeared. Also in 1939, Campbell started the fantasy magazine Unknown (later Unknown Worlds). Although Unknown was canceled after only four years, a victim of wartime paper shortages, the magazine's editorial direction was significant in the evolution of modern fantasy.